As I returned home from my long oversea trip, one of the first thing I did was checking my mailbox. Out of hundreds of mails, one big envelop caught my attention. 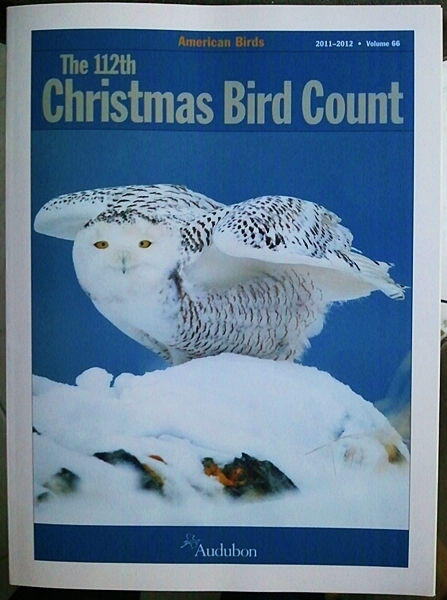 From the sender, National Audubon Society, I immediately knew this was my copy of 112th American Birds, an annual publication from prior year's Christmas Bid Count result! You might not notice your copy, but as soon as I tore its envelop and took out my copy, a Snowy Owl cover popped in front of my eyes! "Wow! What a gorgeous owl! ", I thought. I flipped through pages and came back on the cover and could not stop thinking, " What if I can see this bird one of these days. Should I travel to Canada?" 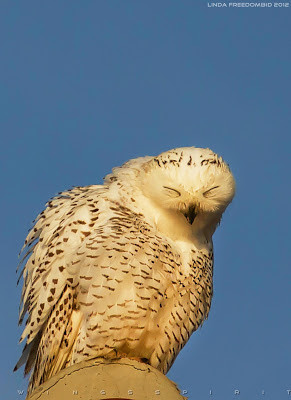 I was thinking how cool and amazing that would be if I can just photograph one Snowy Owl in the wild! That probably is every wildlife photographer's dream if I'm not exaggerating. So I was thinking in my mind since this year's Christmas Bird Count will not start until two weeks from now ( 12/13/2012 through 1/5/2013), why don't I use this beautiful magazine cover as my Facebook profile photo to encourage birders alike to support this proud American tradition! Something very strange was that I have not had time to check my Facebook until late Monday night on December 3. Many of my good friends, such as James Fleullan and Angelia Jenkins "liked" my new profile photo as soon as I posted it. Unbelievably, someone (later I found out her name is Kristen Morris, a Sea Island naturalist) from Sea Island reported this amazing find to DNR just less than 20 hours after my Facebook posting!!! Is this merely a coincident or it meant to be? I don't normally check my GABO-L emails as often as I'd like to due to my busy work schedule. But with technology of smartphone, stay connected is just a matter of few finger strokes. Mrs Morris is very accommodating and offers two trips in the next day for Georgia birders to see this amazing bird. The only two sightings of Snowy Owl in the state of Georgia since 1990 was one in Lafayette on 11-26-2001 and the last one in north Macon on 12-9-2004, according to eBIRD archive. Just think how cool this is for a Snowy owl to reappear in Georgia after 8 years! Morris's morning trip was full immediately. I called my good friend Mark McShane, thinking he might already be on his way to Sea Island. Surprisingly, he told me he will be leaving midnight on Wednesday (12/5) and Mark asked me if I have a "pass". I have no clue that Sea Island is a private island and it requires a pass or invitation to enter. So, I said to Mark ..."that means you have a pass, cool!". It's like a perfect puzzle and all pieces of this puzzle fall into a right place at a perfect timing! I flew down overnight and joined Mark and car-pooled with him and his two buddies from St. Simon Island and when we were munching breakfast at McDonal's, Mark jokingly mentioned to me "maybe our Snowy will not be there today! "...So negative! Then I said "Snowy will show up at the place where we stop next!". Not sure why, I am just so certain and confident that Snowy is waiting for us, he is waiting for me, he is waiting for an ancient heart loving him for a thousand years! We arrived on Sea Island, Mark called Kristen at 6: 50 AM. She said "I am looking at him right now!" Wow! Kristen's delightful voice was like a first ray, the breaking dawn! My heart was racing.....The rest of the story is a history and I made this special video for those who love Snowy but did not have the chance to get to see him and I hope you enjoy! Snowy again was found back on Tybee Island in the past week or so. This bird can been seen atop the condo at 1701 Strand St. There are many people here that I wish to thank and chasing this Snowy Owl will not become possible without your efforts: Kristen Morris, the first person on Sea Island to report this finding and she gave us a good direction for where to park our car and saved us from tedious long walking on beach and where to look for this owl; Tim Keyes' prompt report on GABO-L made visiting this private island becomes a joyful and hassle free trip; my good friend Mark McShane's dedication motivated me to start driving in the middle of the night (thanks to my own "jet lag" and I was not sleepy at all) so I get to see this beautiful bird and photograph him in the best morning light condition! We later birded Jekyll Island, St. Simonds Island and Altamaha WMA and thanks to Trey McCuen, I gained five more lifers including a flock of Black-bellied Whistling Ducks! 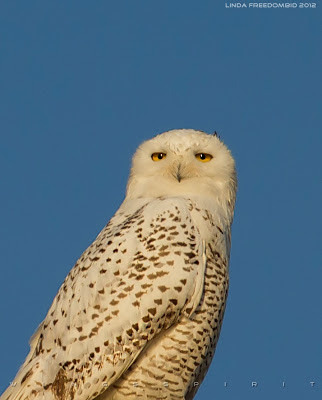 I saw a Snowy Owl here in north Florida in 2011. I had many people tell me I was mistaken, that I was seeing things, that it was impossible. I knew what I had seen but stopped talking about it because of all the flak I received. I live on about 125 acres in the Florida flatwoods, about 3 hours southwest of Sea Island. Your post validates my sighting! Thanks!! Thanks Molly! Young Sonwy will travel far away from their birthplace and they will return to their birthplace to breed once full grown. However it's very rare to see them this far south (2 sightings in Georgia in the past 22 years). So keep an eye on them. They like to sit on top of a building, chimney cap, telephone pole or treeline top. Report to your local Audubon or eBIRD.org if you see it again! Good luck! Thank you, Linda. Sorry for the delay in my response -- I didn't get back to your site until today. I wish I'd had my camera with me! He was sitting on top of a power pole in my neighbor's yard, only about 50 feet away -- what a beauty! Thanks again!! Fantastic Photographs and content - I linked to this Blog and your Flickr post today. Thanks Backyard Birder! I am glad you enjoy my work . Happy reading and happy birding!